The popularity of the marble has reached an edge and to meet the demand and ease the production processes, marble industries are banking upon the material handling system to augment the operation ability and meet higher demands. However, the heavy load and abrasive nature of the marble results in the frequent changing of the conveyor belt and thusly higher downtime and costing. With an aim to solve this issue, we introduce an exclusive range of the conveyor belt for marble that attributes high impact strength and excellent abrasion resistance. 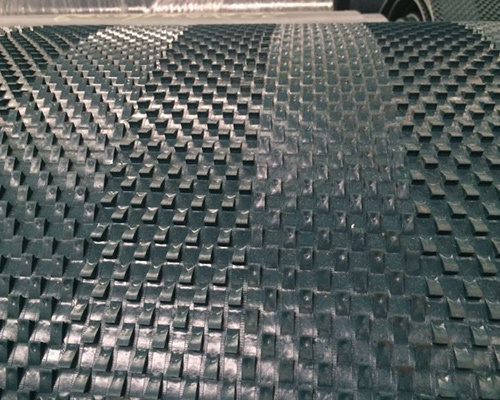 This conveyor belt for marble is manufactured employing vulcanized PVC/PU material to convey high impact strength against the heavy load, wherein the multilayer of the rubber is fused by the hot vulcanization technology. The every conveyor belt for marble offered by us has undergone the sharpness tests along with impact strength test and also passed with the certain level that demonstrates its higher safety and reliability side for the heavy load applications. No matter, how heavy marble, granite, ceramics or stones you want to process, our conveyor belt for marble promises to make your product reach at the destination without failure and promises highest productivity. The sharp edges or cutting of the respective product is no more a matter of concern, as our marble conveyor belt shares excellent resistance against abrasion and cut that promises to ensure unfailingly conveying of thereof at cost effective rates. We as a conveyor belt manufacturer are well versed enough to proffer the best possible combination of the cleats, sidewall, high profile, with the marble conveyor belt that can match flat, inclined as well as the perpendicular conveying need of yours at the cost effective rates.